In four decades of owning racehorses, the William Street syndicate has had a knack of always finding a ‘good one’. 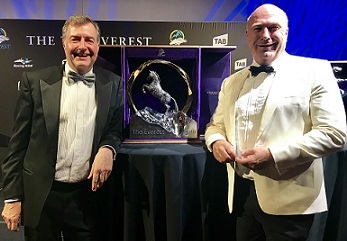 William Street syndicate members Michael Clemenger (left) and Michael Ramsden with the TAB Everest trophy. Think Melbourne Cup winner Gurner's Lane, Caulfield Cup winner Paris Lane, Queensland Derby winner De Gaulle Lane and now a runner in Saturday’s $13 million TAB Everest (1200m) in Santa Ana Lane. The six-year-old has handed the now 41 member William Street team three Group 1 wins and is regarded as the best horse they’ve raced to date. Syndicate members Michael Ramsden and Michael Clemenger said the group was started by just three members who attended a club in the William Street area of Melbourne, Ramsden's father was one of the three, but their first foray into racing was a flop. “The horse was called William Street after where the club was positioned, it was no good but the next horse was Gurner's Lane,’’ Ramsden said. The 41 members of the current group own 55 shares and those in Santa Ana Lane include three people who have never owned a horse before. In total the group will be represented by about 90 people on course at Royal Randwick. The eldest member is 88 and William Street still contains one of the three founders, Robin Clements. Once the William Street area could no longer provide names to give their horses they got a bit creative, though still used the street reference, and Santa Ana Lane’s name stems from his sire Lope de Vega. “We named them after lanes but we ran out of lanes around the club so we’ve got involved with some of the breeding and worked out other names,’’ Ramsden said. There is, however, also a street called 'Santa Ana Lane' in California. It was a natural fit for Santa Ana Lane to be picked up for the TAB Everest by slot holder Inglis given that’s where he was sold. The gelding showed early promise winning the Zeditave Stakes at three but Clemenger believes the change of training style when Anthony Freedman took over from his brother Lee switched him on. “For about 18 months he didn’t quite have it,’’ he said. The following season saw Santa claim his three Group 1s – the Sir Rupert Clarke, The Goodwood and the Stradbroke but it was his record-breaking Premiere Stakes win over the Everest course two weeks ago that announced him as a serious contender. He took about half a second off the Randwick 1200m record in running 1:07.45 with a sizzling last 600m of 32.64 (Punters Intel) in beating four of his 11 Everest rivals. Clemenger said after the Stradbroke win the team set their sights on an Everest slot and Freedman gave them plenty of confidence in his post-Premiere Stakes report. “After he won the Premiere Anthony was very cautious, hoping he wasn’t flattened, but he has since said he is very happy with the horse,’’ he said. We asked Freedman for his thoughts on Santa Ana Lane, and stablemate Shoals, and he said both horses came through their Premiere Stakes quinella with flying colours. On Friday morning, Shoals was $7 TAB Everest second favourite with Santa Ana Lane at $9. “I can’t split them, they were close the other day and they are in similar shape. I imagine they will finish close on Saturday, wherever that is,’’ Freedman said. As for Santa Ana Lane specifically, he said the gelding is a legitimate winning chance and just wants a fair racing surface. When asked about what turned Santa Ana Lane into the top class sprinter he is now Freedman put it down to maturity and soundness. “He had a few feet issues which, touch wood, are behind him now and that’s probably the main reason,’’ Freedman said.